I’ve come to appreciate Diptyque as a perfume house instead of as just a candle maker. This appreciation, however, has evolved out of my love of candles, which led to my decision to find and smell every possible candle stamped with the Diptyque name. Within each of their candles lurks the essence of Diptyque, and behind that is the inspiration of great perfume makers. 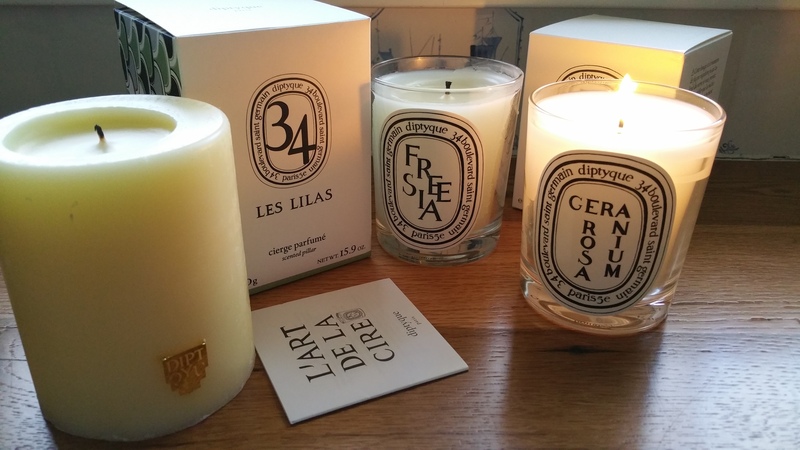 If you aren’t familiar with my blog, I’ll tell you that I’ve been keeping track of the Diptyque candles I’ve smelled, what scent category each one is in, and whether or not I’d re-purchase the candle. 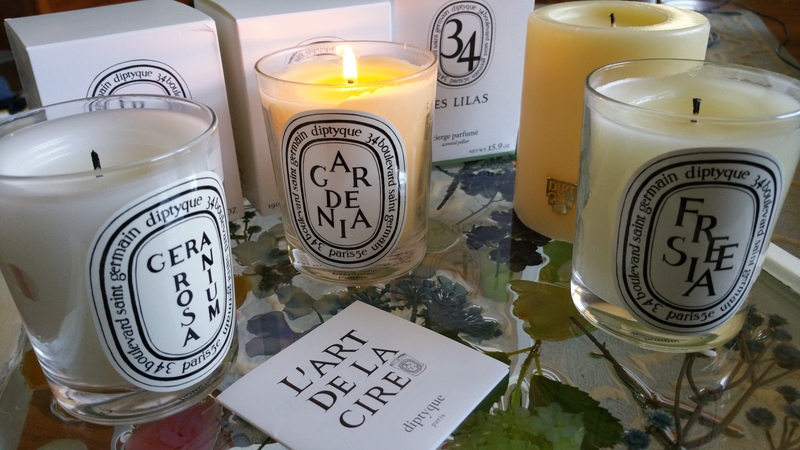 (See my Diptyque reference guide, and a primer on candles in general). Along the way I’ve not loved every single Diptyque candle. Some scents I downright disliked. But when I step back and consider the whole experience, I am awed by the power of Diptyque. Within the Floral Category, I reviewed both Choisya and Muguet, here. But there are many more to look at within the category. In continuing my reviews I’m focusing here on Les Lilas (Lilac), Geranium Rosa (Geranium Rose), Gardenia, andFreesia. From what I can determine, Lilas (Lilac) was sold both as a 15.9 oz pillar and as a 6.5 oz jar candle, but neither the pillar or jar form are currently available in the online Diptyque boutique. I found the pillar version online at Saks, but I have not idea how many are available there or for how long they will be there. But I may need to get a backup, because Les Lilas turned out to be a stunning candle, both physically and in smell. I’ve wanted to burn it constantly since getting it. Interestingly, Les Lilas is described as a combination of floral scents and not as just the scent of a Lilac flower or bush. The description mentions “a floral blend of white lilac, heliotrope, choisya, and spearmint.” I would not have known the difference between an actual Lilac and this composition of scents Diptyque put together. The end result is just lovely and works seamlessly. It is not too sweet or feminine in my opinion. I wouldn’t call it a “neutral” scent, but I find it appropriate for any occasion and for any room in the house. Rose Geranium is one flower, like Lily of the Valley (Muguet), that I did not realize I recognized from my experiences. 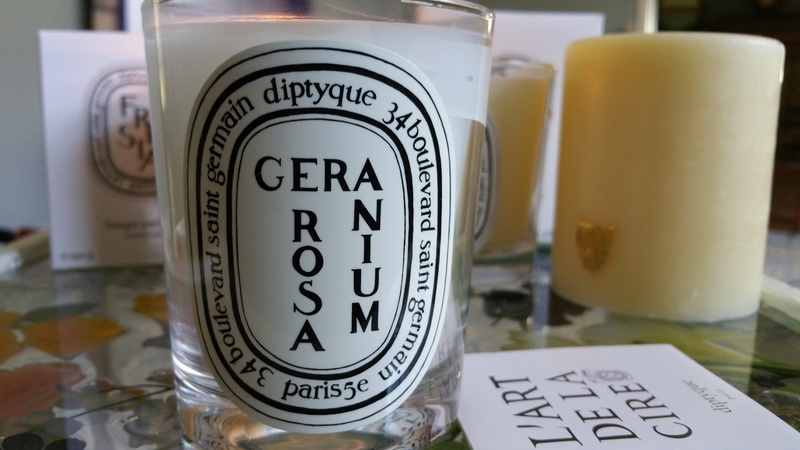 But the Geranium smell was obviously familiar to me as soon as I unwrapped this Diptyque candle. The clean, zesty smell is very pleasant and works well in the kitchen or in a bathroom. It makes me recall vaguely a cosmetic or skincare item I’ve used in the past, probably from Whole Foods. I associate this smell with health, freshness, and beauty. Yes, get this candle if you want to try a floral but don’t like the overly heady smells like Roses or Violette. Gardenia was a somewhat familiar scent out of the package. But the candle when lit didn’t release a fragrance that carried as far as other Diptyque Florals. I am not drawn to this scent in any way and it didn’t resonate with me like others did. I neither dislike this candle nor really enjoy it. But Gardenia is very “real” smelling. There is no extra sweetness or falseness or pretense in the smell, and Diptyque hasn’t tried to doctor it up as anything other than how a Gardenia smells, which I appreciate. But in trying to describe it in words, I’m totally lost because it doesn’t smell like anything but a Gardenia! 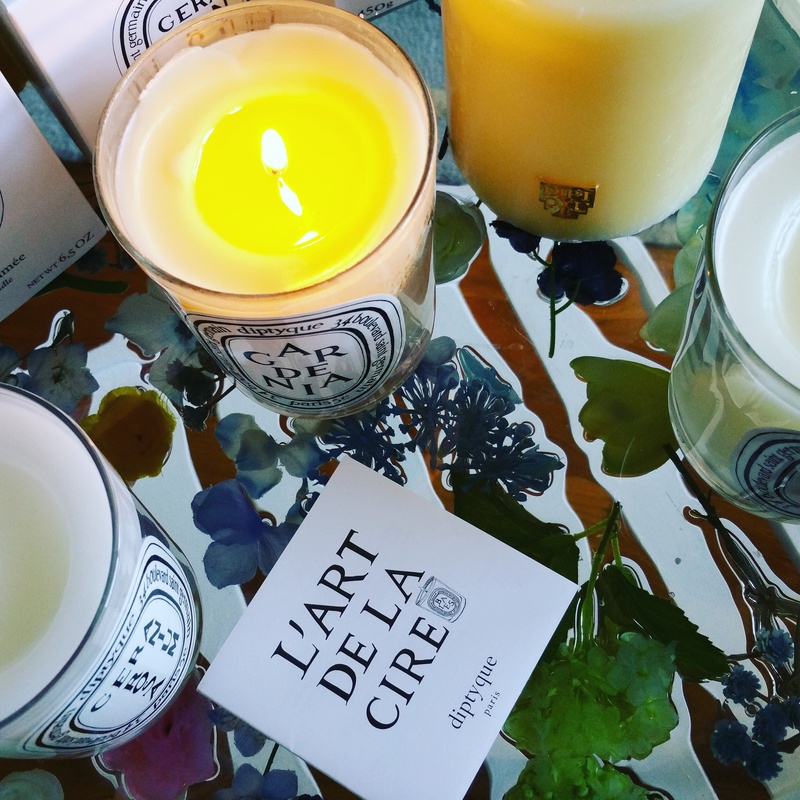 Diptyque’s Freesia candle is very different than the three other floral candles featured in this post. It’s a sweet and heady fragrance, and not a soothing or calming, or even a zesty one. The last time I had smelled Freesia before getting this candle was years and years ago, in the form of a then popular body spray or lotion (possibly from Bath & Body Works — I cannot exactly remember). I never personally wore anything Freesia scented because I always found it too sweet to wear. Diptyque’s Freesia Candle is just on the edge of the bearable range for me. I don’t love it but that’s because I don’t love the smell of an actual Freesia. However, that’s not Diptyque’s fault. In fact, Diptyque did it’s job just fine here. Diptyque replicated a Freesia flower for those who enjoy it’s fragrance. As you’ve guessed, my favoriate candle within this bunch of four is Les Lilas. It’s unfortunately, also the one that is no longer available in a jar. I am hoping Diptyque will decide to release the 6.5 oz version of Lilas so that I can house it away with my other favorite jarred candles! Still to come in the Floral Category are: Mimosa, Tuberose, Roses, Violette, Jonquille, Jasmin, and perhaps some non-standard florals as well, like Rosaviola and Rosafolia. If you’re also a Diptyque lover please tell me what your favorite and less favorite florals are. I’d love to hear about it!